Ryan Brothers Ambulance Service medical director John Yost, MD, observes as Lou Sanner, MD, MSPH, teaches basic life support in obstetrics skills to paramedics there. 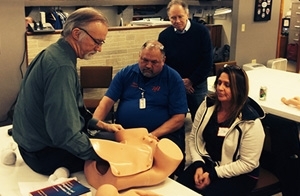 On January 27, 2014, Department of Family Medicine (DFM) faculty, residents, and colleagues taught the first Basic Life Support in Obstetrics (BLSO®) course in Madison to paramedics at Ryan Brothers Ambulance Service. BLSO is a day-long course that prepares participants to attend a normal delivery and to recognize and manage obstetrical emergencies. It’s aimed at emergency medical technicians (basic and paramedic) and other emergency personnel, including nurses, medical students, nursing students, physician assistants and nurse practitioners. In fact, when course participants were asked if they had ever had to attend the delivery of a baby in an ambulance, everyone raised their hand. Those who take BLSO will be better equipped to attend normal and complicated deliveries, and will also have the language and skills to better coordinate care with others who have more advanced maternity care skills. The Madison BLSO course was the fruition of collaborations between the DFM, Ryan Brothers, and colleagues at the University of New Mexico. John Yost, MD, the medical director for Ryan Brothers, a family physician and former emergency room physician, sponsored the first BLSO course in Madison. The DFM’s Lee Dresang, MD, was course director for the January 27th course and is co-editor of the BLSO curriculum, which is owned and run by the American Academy of Family Physicians (AAFP). Larry Leeman, MD, from the University of New Mexico Departments of Family and Community Medicine and Obstetrics and Gynecology, was advisory faculty for the January 27th course and is co-editor of BLSO curriculum. Course instructors from the DFM included: Ildi Martonffy, MD; Lou Sanner, MD, MSPH; Sarah James, DO, and Baraboo resident Rachel Hartline, MD. The BLSO course is a one-day version of the Advanced Life Support in Obstetrics (ALSO®) course, which was developed in 1991 by the DFM’s John Beasley, MD, and James Damos, MD, and has since been taken by over 160,000 maternity care providers in over 60 countries. Both ALSO and BLSO teach key clinical skills, such as maternal resuscitation and postpartum hemorrhage, neonatal resuscitation, and shoulder dystocia. BLSO also has unique workshops for normal labor and emergent prenatal assessment. Interactive, small-group workshops and case discussions are central to both courses’ success. Participants learn from and enjoy the opportunity to practice maneuvers using pelvic mannequins. Mnemonics also help them remember skills that may not be needed for months, but may be called upon urgently to save the life of a woman and/or her baby. As with BLS/ACLS for cardiac life support, those who take BLSO may decide later to take ALSO to expand their skills and knowledge. Although BLSO was released in the U.S. in 2012, and is still in its infancy, it is ahead of the ALSO course in some ways. With course evaluations demonstrating the success of the first BLSO course in Madison, Dr. Yost says he plans to train other paramedics in BLSO. That means that BLSO will likely follow in the footsteps of ALSO—an important, hands-on, evidence-based course that started in Madison and spread across the world.